Himalayan mountain system is distinguished globally for a rich biodiversity and for its role in regulating the climate of the South Asia. Traditional crop-livestock mixed farming in the Himalaya is highly dependent on forests for fodder and manure prepared from forest leaf litter and livestock excreta. Apart from sustaining farm production, forests provide a variety of other tangible and intangible benefits, which are critical for sustainable livelihood of not only 115 million mountain people, but also many more people living in the adjoining plains. Extension of agricultural landuse coupled with replacement of traditional staple food crops by cash crops and of multipurpose agroforestry trees by fruit trees are widespread changes. Cultivation of Fagopyrum esculentum, Fagopyrum tataricum, Panicum miliaceum, Setaria italica and Pisum arvense has been almost abandoned. Increasing stress on cash crops is driven by a socio-cultural change from subsistence to market economy facilitated by improvement in accessibility and supply of staple food grains at subsidized price by the government. Farmers have gained substantial economic benefits from cash crops. However, loss of agrobiodiversity implies more risks to local livelihood in the events of downfall in market price/demand of cash crops, termination of supply of staple food grains at subsidized price, pest outbreaks in a cash crop dominated homogeneous landscape and abnormal climate years. Indigenous innovations enabling improvement in farm economy by conserving and/enhancing agrobiodiversity do exist, but are highly localized. The changes in agrobiodiversity are such that soil loss and run-off from the croplands have dramatically increased together with increase in local pressure on forests. As farm productivity is maintained with forest-based inputs, continued depletion of forest resources will result in poor economic returns from agriculture to local people, apart from loss of global benefits from Himalayan forests. 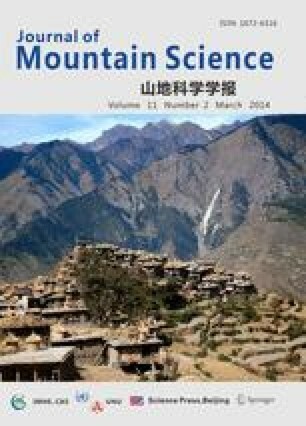 Interventions including improvement in traditional manure and management of on-farm trees, participatory development of agroforestry in degraded forest lands and policies favoring economic benefits to local people from non-timber forest products could reduce the risks of decline in agricultural biodiversity and associated threats to livelihoods and Himalayan ecosystems.